Though previously considered nonpathogenic, it can cause opportunistic infection in an immunocompromised patient. , Infections vary from bronchial, oral, intestinal, cutaneous, and even disseminated infections. ,, To the best of our knowledge, urinary tract infection (UTI) caused by G. candidum has not been reported till now. We report a case of G. candidum as a significant pathogen of UTI in a septicemic patient. A 20-year-old female was admitted to BIMS Hospital with complaints of giddiness, breathlessness, abdominal pain, and generalized weakness since day 1. The patient had undergone tubectomy in a private nursing home 2 days ago. The patient was P 2 L 2 A 0 . She had delivered a male child 1 month ago by normal delivery. On examination, the patient had pallor, fever (>100°F), blood pressure of 100/70 mmHg, and respiratory rate of 34 breaths/min. Abdominal examination revealed distended abdomen and bloody discharge at the suture site with a gaping wound. Peristaltic sounds were sluggish with abdominal rigidity. The patient was diagnosed as a case of perforative peritonitis. She was started on broad spectrum antibiotics. On emergency, laparotomy ileal perforation was detected, probably secondary to injury during tubectomy. Postoperatively, the patient developed hypostatic pneumonia of the left side and was put on ventilator. She had hemoglobin of 7.3 g% and total leukocyte count of 15,650/μL, with 69% neutrophils, 27% lymphocytes, and 4% eosinophils. 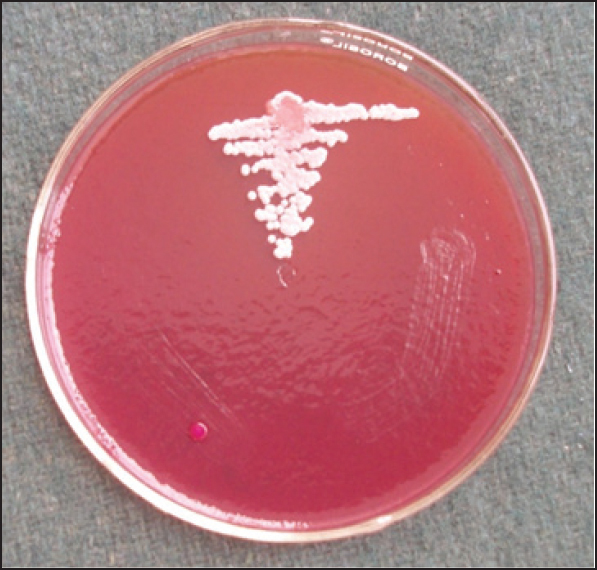 Pus sample was taken from wound-isolated Klebsiella pneumoniae. The patient developed UTI on the fourth day of catheterization with obvious hematuria. Urine sample was collected by aseptic precaution and sent to a microbiology laboratory. Urine sample was streaked on blood agar and MacConkey agar by the T-method on 2 consecutive days, that is, day 4 and day 5 after admission. Urine examination showed 6-8 pus cells/high power field (hpf), and 4-5 red blood cells (RBCs)/hpf with hyphal structures. Gram stain showed pus cells with hyphal structures that were rectangular in shape, measuring 4-8 μm, with a characteristic hockey stick appearance [Figure 1]. Urine culture isolated the growth of G. candidum in pure culture with a significant colony count. The colonies were dry, white to cream colored, and had a hairy appearance [Figure 2]. The patient's condition deteriorated on day 5 and she succumbed to illness after 6 days of admission. G. candidum is a fungus found saprophytically in nature and as a commensal in the mouth, bronchi, lungs, and gastrointestinal and genitourinary tracts. Although rare, it can cause opportunistic infection in immunocompromised individuals such as those with leukemia, renal transplant, and neutropenia. , Bronchial geotrichosis is the most common form of presentation followed by skin, gastrointestinal tract, oral, and disseminated infection. ,, UTI is very rarely encountered and to the best of our knowledge, no case has been reported till now in the world literature. In our case, the patient developed UTI following catheterization. Indwelling catheters serve as the nidi for bacterial and fungal growth and act as sources for UTI. Being a commensal in the genitourinary tract, G. candidum must have caused UTI in the particular case because of the debilitating status of the patient. Repeated isolation of G. candidum with characteristic arthropores and hyphae in fresh urine samples, both by direct microscopy and culture, confirmed the diagnosis of geotrichosis. Also, the absence of other urinary tract pathogens added to the confirmation of urinary geotrichosis. G. candidum was considered a significant pathogen for UTI in our case because of repeated isolation with significant colony count and also isolation on all the culture that media inoculated. Also, the patient had clear signs of UTI. Microscopy showed an etiological agent, along with inflammatory cells. G. candidum infection rate is underreported since it can be misidentified histopathologically as Candida spp., Aspergillus spp., or Trichosporon spp. This possibility of misidentification illustrates the importance of obtaining fungal cultures in addition to histopathological studies. Better awareness of its pathogenicity could delineate its true incidence, patterns of clinical disease, and response to therapy. Rippon JW. Medical Mycology: The Pathogenic Fungi and the Pathogenic Actinomycetes. 3 rd ed. Philadelphia: WB Saunders; 1988. p. 714-8. Varghese S, Ravichandran P. Geotrichum candidum infection in a renal transplant recipient. Indian J Nephrol 2003;13:72-4. Kassamali H, Anaissie E, Ro J, Rolston K, Kantarjian H, Fainstein V, et al. Disseminated Geotrichum candidum infection. J Clin Microbiol 1987;25:1782-3. Ramani R, Rao PV, Kumari GR, Shivananda PG. Pulmonary geotrichosis. Postgrad Med J 1992;68:150.